As BAWP T.C’s we are frequently faced with the question of how to use what we’ve learned about writing in individual classrooms to inform work at the school or district level. This workshop will discuss one way this was done in the Oakland Unified School District. Stan Pesick (1988 invitational) taught high school history and social student in Oakland public schools for eighteen years. Between 1997 and 2012 he worked at the district level on developing and implementing history curriculum and staff development programs in OUSD. He currently works on professional development projects at Mills College and BAWP. Shelly Weintraub (1979 invitational) taught middle and high school students in Oakland public schools for fifteen years. After that, she worked to coordinate history curriculum and staff development for OUSD. She is now retired. This workshop presents a strategy to engage students in discourse that scaffolds argumentative writing. The three rounds of conversation lead students to construct the components of an argument. Aijeron Simmons teaches 5th grade at New Highland Academy in Oakland Unified School District. A graduate of Mills College Masters Program, Aija currently serves as a Program Associate of the Mills Teacher Scholars Inquiry Group. Aija became a BAWP Teacher Consultant in 2009. 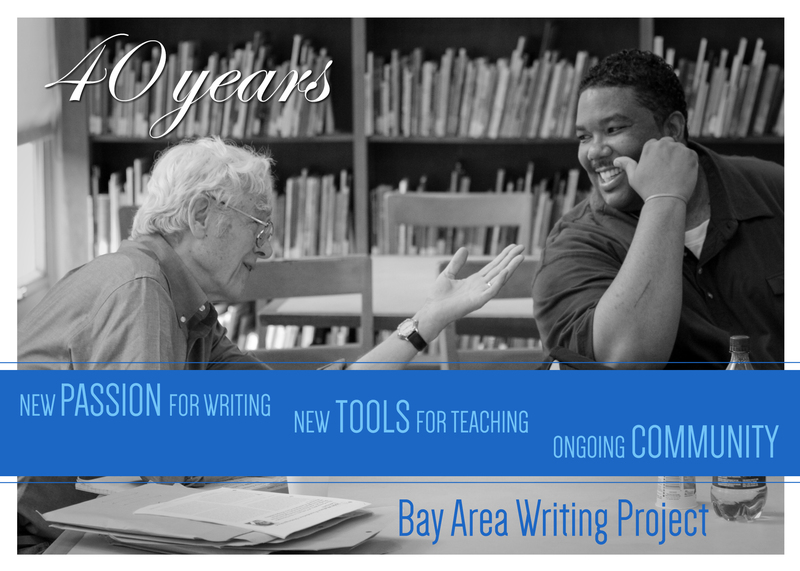 Hear a story of how one teacher’s classroom practice was transformed by BAWP. Cherise will share how the use of scaffolded writing assignments and literacy structures improved her students’ quality of writing. Cherise currently teaches English at Chabot College and is a Supervisor for the MUSE program at UC Berkeley (coaching high school teachers and teaching their practicum course). Workshop: The Director is In! BAWP Director Greta Vollmer will be on hand with a roster of projects, possibilities and job openings for BAWP TC’s. Come talk to her and find out more about the myriad ways you can get more involved with BAWP. Marna Blanchard teaches 8th grade Humanities and a media class at Francisco Middle School in San Francisco. In addition, she also teaches at the Young Writers Camp for digital storytelling here in the Bay Area, as well as similar workshops in S. Korea, Singapore and China. Marna is a frequent contributor to BAWP’s Digital Paper. This Proteus Project — -which has been taught to remedial high school students as well as second semester English composition students – asks students to pursue a critical question about a topic about which they are passionately curious. Their research takes them not only through conventional reading assignments, but also to interviews, observations, participation, and, more recently, how social media can be used as a research tool. Join us for a morning of topic exploration, critical research questions, methods of research, and ultimately, high-engaging, well-written, well-researched student writing. Laury Fischer started his 41st year of teaching this year. He taught high school for nearly twenty-years, co-directed the Bay Area Writing Project, and has been teaching English at Diablo Valley College since 1991. He has taught in Greece, Japan, the Virgin Islands, but mostly, and most importantly, in California. Something bugging you? Really bugging you? Need to get it out? Why not write it down and let the world know your problems while learning to turn a pet peeve into a powerful argument. John Levine is a writing teacher in the College Writing Programs at UC Berkeley, a playwright whose work has been performed throughout the US and overseas, and a writer with pieces published in numerous anthologies. PARKING: Limited but unrestricted side street parking on Saturdays. For UC Berkeley parking lot information visit pt.berkeley.edu/park/public/campus or take BART and exit at the Downtown Berkeley station. Only a 10-minute walk! FOOD: Coffee, bagels and fruit will be provided in the morning. Please sign up and register for lunch by Tuesday at the latest! We will need to close registration at that point; however, if you don’t plan to join us for lunch, please feel free to stop by for whatever portion of the morning you can.